Bible translation is not a casual enterprise because it involves bringing the life-saving Word of God to people in their own language. And selecting a Bible translation is not on the order of picking out a sweater. It’s more like picking a doctor – someone you can trust. What a privilege to have God’s Word! The infinite, holy, and loving Lord of the universe chose to reveal Himself in human language (working through human authors) to sinners who did not deserve even a single word from Him. And what a privilege to have God’s Word in English! We are immeasurably blessed to have several modern English translations that suitably convey the meaning of the Hebrew, Aramaic, and Greek originals in 21st century English. 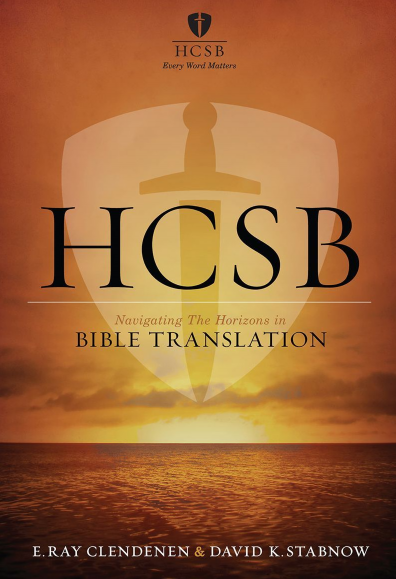 One of its chief editors, E. Ray Clendenen, has written a FREE ebook on the HCSB and Bible translations in general. He surveys a little history of Bible translations, gives insight to the translation process and the various issues that arise, and offers a few tips along the way. There are both popular and technical parts to this book. While I personally prefer the English Standard Version (ESV) as my translation of choice, this eBook provides great insight into the making of a modern English translation and the challenges faced therein. And, as I like to say often, the price of free is hard to beat! Give it a look and feel free to share with others. Lastly, I’d love to know what your translation of choice is and why? I personally prefer the English Standard Version (ESV). One of my main reasons for this is that it accurately translates Greek grammar into English grammar, which is also highly readable. They don’t take anywhere near as many liberties as some modern thought-for-thought translations do. If you have an understanding of the Greek language, one example is how the ESV accurately translates parts of speech from Greek into English (e.g., a Greek participle into a English participle), rather than changing the part of speech into something else and losing meaning if you’re an average English reader with no knowledge of ancient languages. Another main reason I prefer the ESV is that a great number of pastors and theologians that I respect either prefer the ESV themselves or highly commend it.